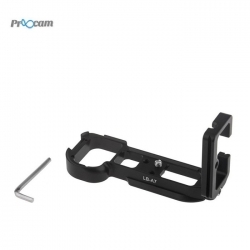 Quick release L-bracket & camera grip custom for Sony A7 II, compatible with Arca-Swiss standard. Both the base plate and vertical plate are compatible with RRS lever-release clamp. Features a detachable design, the base plate and vertical plate can be easily disassembled and assembled to fit different shooting experience. Will not affect a7/a7R battery compartment lid opening and the data cables hatch opening, will not affect the screen folding and opening, will not affect the installation of LA-EA4. The base plate has reserved extra 1/4"-20 threaded mounting holes and strap hole for additional functions. Please note: Camera is not included. Compatibility: Standard Arca-Swiss dovetails, compatible with Arca Swiss, RRS, kirk, Wimberley, Markins, Sunwayfoto, Benro, Suri, Fotopro... brands with AS stardard.